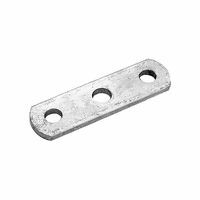 This trailer axle U-Bolt Plate is designed to be used on 1-1/4 in x 1-1/2 in square beam axles and light duty tube axles, and for 1-3/4 in wide springs. Constructed of corrosion resistant Galvanized Steel. Use 1/2 in bolts, and Seachoice U-bolt Model 57431.